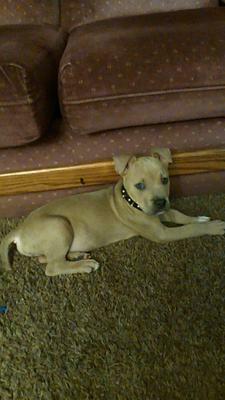 Here is Razor he is between 7 and 8 weeks old. I got him from my niece who got him from another lady. I have him enrolled in obedience training. He starts next month I got him to protect my mom. I work nights as an armed security guard. When playing with him he will rare up on his hind legs. Its funny watching him do that. And when he and my mom's little dog get into it, he doesn't hurt him. But boy mom's little dog will run him off. But he just keeps coming back for more. I work with him my self on sitting but just having problems with him potty training him.